This is the day, in 1890, that Vincent Van Gogh died. His cause of death is often stated as a suicide, but the evidence is/was far from conclusive. Vincent very well have been murdered. Naifeh and Smith make a very compelling case and their book is meticulously, thoroughly and lovingly researched. A long read but never a slog. The Sound of summer includes the sound of flip flops. Even in places where flip flops aren’t the best choice. Like anyplace that isn’t a beach. You can hear them coming. And going. Without looking at feet, you know what’s on them. So while the girl was asking, “Have you ever heard of a drink called…..a flap?” I was hearing flip-flops. And she smiled real big and said, Yes, THAT’S it!” and her sister got closer, and her Mom and there were others and it was hard to tell who was together-together and who was just together as in there in the moment together. So I describe how a frappe was a milkshake with ice cream, and if they ordered a milkshake ‘round these parts, they were likely to get shook milk, no ice cream. Both girls were under the age of 12 so rum drinks weren’t what I first thought of when this line of questioning began, and then I remembered…. Are you asking about Flip? Now everyone was smiling and nodding…. Now, thanks to Paula Marcoux I know from flip. Beer, rum, molasses, hot poker, done. I know oodles of other things from her, too, but flip and rum had come up recently, and put her in my thoughts, and memories of flips past…. in the way rum drinks do here in New England. It’s not exactly flip season here, with temperatures and humidity both in the high ‘80’s, but no season is truly far from another here in New England, so soon enough it will be flip appropriate time. I had recently been flipping through Mrs. Child’s (Lydia Maria, not Julia) “American Frugal Housewife”, the way one does in the food history biz. I was (and still am) wrestling with the differences/different-name-for-the-same-thing conundrum between flapjacks, slapjacks and flatjacks. In short, sorting out the Jack branch of the fritter family. Child, Mrs. The American Frugal Housewife, 12th Boston: Carter, Hendee and Co. 1832. Reprinted 1980. p. 74. Paula’s has directions for flip (with a photo step by step) in Cooking With Fire. And she has notes on these pancakes in the appendix, where she recommends adding a pinch of salt and an egg. And cook them in bacon grease. All good. I’m still thinking about rum in pancakes……with blueberry pancakes and cinnamon? With rum butter? Are these supper pancakes rather than breakfast pancakes? So I told the girls about flip pancakes, too. And then I wondered – what sort of New England Colonial Educational Experience was this family on that involved Flip? Cause that’s the field trip that I want to go on. I bought a rosemary plant at the farmers market last month; considering my luck with growing rosemary (NONE) I also bought some really beautiful stems. She said put them in water and they’d root.I bought more then I needed….the price was right. I used what I wanted, put the stems in a jar with water….Now they have beautiful roots and smell great every time I brush by them. Not quite ready to bloom, but anything that grows in the dead of winter is encouraging. I have a nice terra cotta pot…time to try chives? Van Gogh, you inspire me! Van Gogh, Flowerpot with Chives, January-February 1887. Oil on canvas, 31.9 x 22 cm. Van Gogh Museum, Amsterdam. Early Influencers in my culinary biography were the food itself and the people who made or brought or served the food. Events (Christmas! Birthdays! The Fourth of July!!) shaped/warped/twisted/ influenced me, and even at an early age, books. This is Betty now – looking good, girlfriend! 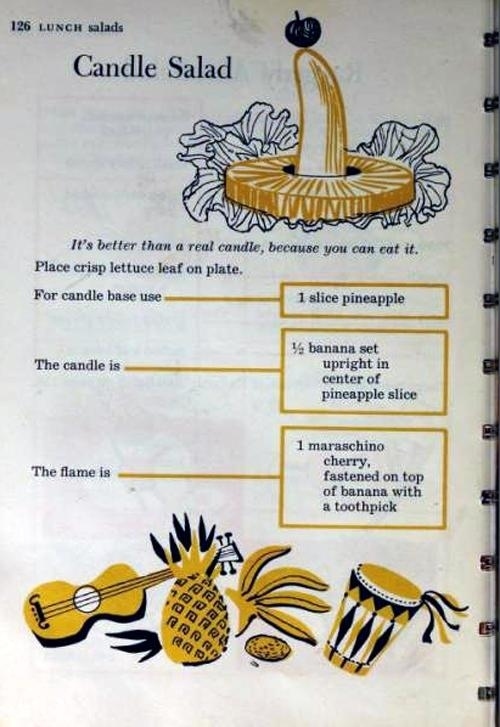 This was the cookbook my mother had…. This is very similar to the illustration, but I’m not sure if it’s THE one – I’m working from internet images and my mother still has her cookbooks. I think they’re in a box somewhere. I wanted to make this. 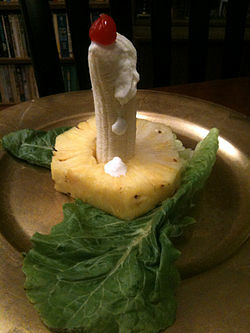 I wanted to make this even though I do not like bananas, not one little bit and I did not like them then either. I might have liked bananas even less when I was little. I didn’t even like touching bananas. Or banana smell….still. Spare me the analysis. Sometimes a banana is just a banana. There was also something with canned whole pears….. 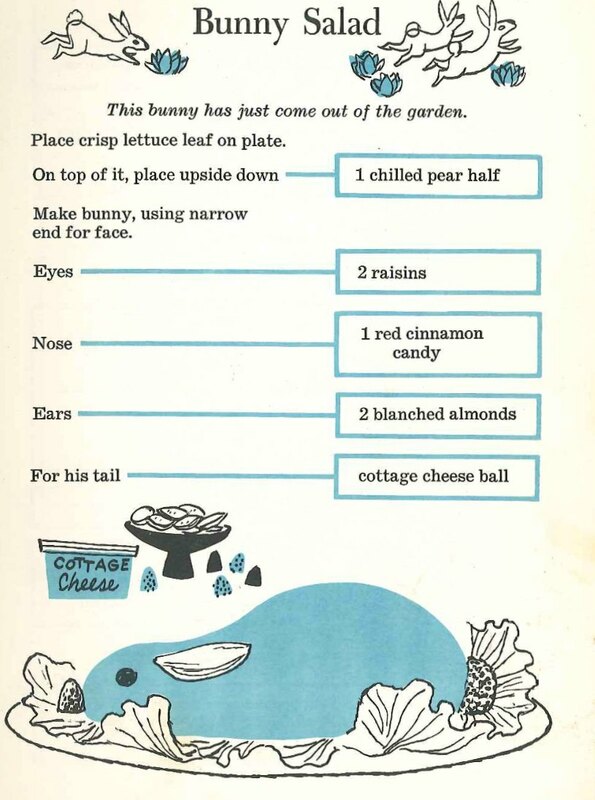 I must have been studied these before I knew how to read…although I have eaten many a rabbit, my three year old self might have objected to Bunny Salad that looked so much like…a bunny. And a blue bunny, at that. Blue Bunny Ice Cream logo – Betty Crocker inspiration piece? Turns out Blue Bunny ice cream is older then Betty Crocker. 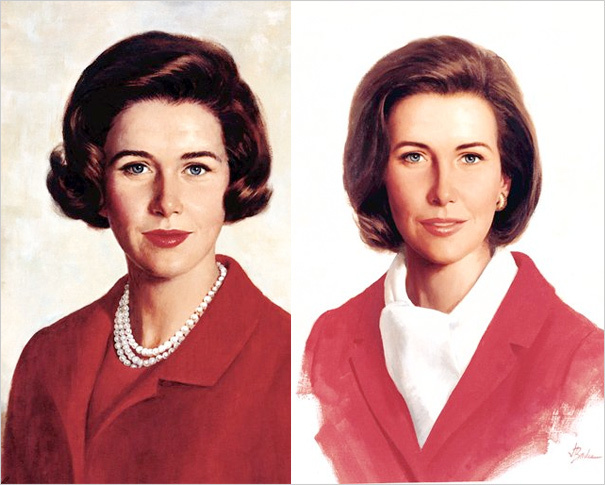 So Betty’s not a real person (although she was played by an actress for TV for a while) and her name is all over boxes in the grocery store, but she’s not the actual food, she the mixes. 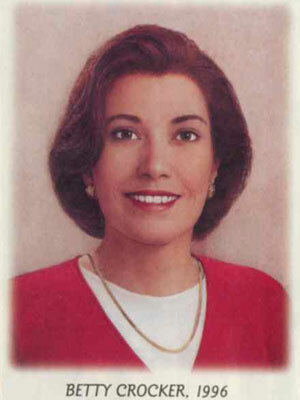 She is a cookbook – several cookbooks, and a constant presence in my childhood. 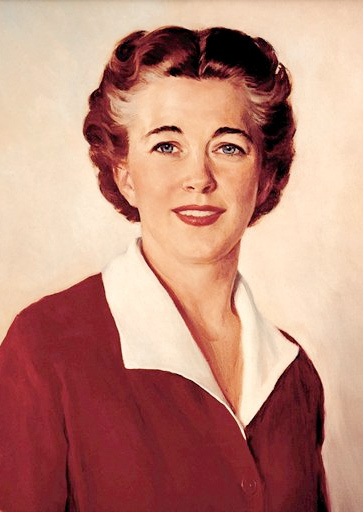 She’s even in my kitchen now, in the form of a red dough scraper with that signature ….signature. The only recipe that I remember my mother using from this cookbook (henceforth BC/CB) was for the sugar cookies, a recipe I’ll be copying out on my next visit to the ancestral home. The other thing or two I learned from the BC/CB, when I was older then three and really knew how to read, was that the Betty World had a very different way of eating then the Wall family. BettyWorld had cake or pie for dessert EVERY night. WallyWorld had – a fruit bowl. With Fresh Fruit. NO canned pears, fresh pears.Fresh apples. Fresh oranges. But no bananas.